Ok here is my plan. 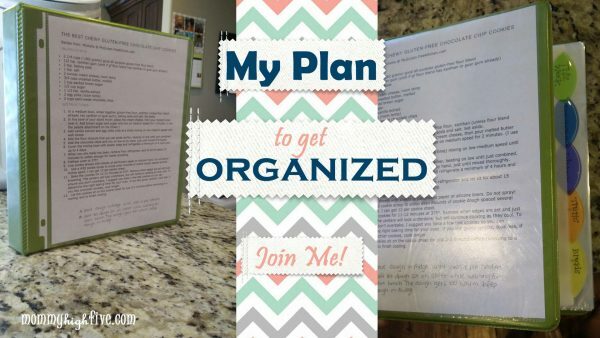 I would love for you to join me in my journey of getting organized. Whether you are gluten-free (GF) or not, just want to eat healthier, or just get more organized with dinner and meal planning join my crazy train. Since I was diagnosed with Celiac, people have been asking me if I plan to switch my whole family to a GF meal plan. At first, I thought that would be way too hard with five little picky eaters. But I also don’t want to be making two separate meals three times a day. That sounds like I would be setting myself up for failure. So, I’ve come up with a compromise right in the middle. Breakfast and lunch are pretty easy. Cereal, or eggs and pancakes for the littles. I can make myself something separate; that’s no biggie. Lunch, same deal whatevs. It’s dinner that gets me. It tends to be the most stressful time of day at our house. We have dinner and chores, a hungry toddler whining at my feet, and kids fighting and whining. Soccer practice, basketball practice, music lesson, homework, you know the drill because you are doing it too. Most nights it can be a total hot mess. So for dinner, it’s easier for me if I just cook one meal that is GF. Now I don’t know about you, but some days are crazy or I am lazy and it is so nice to be able to pick up a Little Caesars Pizza, or Chik-Fil-A and put on my fat pants and call it a night, am I right ladies? I can no longer do that….at least not for me. So I need to plan and be prepared. Now don’t get wrong, I still plan to have lazy nights and there will be extra crazy nights. So for those nights I have some GF frozen pizzas in the freezer for me and a couple other little things for when I am in a bind. But most nights preparation is key. Here’s how I am going to accomplish this. Be sure to get a binder with a plastic sleeve on the cover. Go ahead and buy the pack of 8 divider tabs. I only bought the pack with 5 and I am going to go back and buy another one as I need more sections. On Sunday afternoon during quiet time (quiet time: that time when no one is screaming but they aren’t sleeping either) I will meal plan. I plan to go through my recipe books, look up recipes online, talk to friends and neighbors, use my regular go-to recipes that can be switched to gluten-free or already are gluten-free, and make a plan for dinner each week. I will also plan to throw in a treat or dessert here or there, because I’m wild and crazy! I will print out or type up each recipe so I can start a GF collection for my binder. I will put the print outs in the plastic sheets and put them in the binder. You can label the binder tabs however you’d like. Most importantly the first tab needs to read THIS WEEK. The whole idea is that as you build up your binder week by week you will be able to draw from it and pick and choose and pull recipes and put them in the front section that reads THIS WEEK. Then when the week starts you know what you are going to make. Tab suggestions: Breakfast, Appetizers, Desserts, Cookies/treats, Breads, Miscellaneous (for things like substitutions recipes or different flour recipe combos). 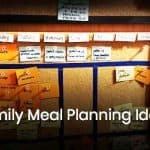 Then when it’s time to make that night’s dinner, pull out the recipe you already have stashed away under the THIS WEEK tab and slide it down the front of the cover of your binder. And now you can stand the binder up on your counter so it is there for you to see. Voila. After I’ve compiled and printed out my recipes for the week I’ll make my grocery list. My plan is to head to the store Monday mornings while all but one of my littles is in school. Now most of these recipes will be new to me and probably all of these recipes will be new to you. As I find yummy gluten-free recipes, I’ll share them with you! If they work for your family, bank them in your binder. After a short time, you’ll have a whole gluten-free recipe book of yummy food that you know your family likes. WIN! And guess what?? 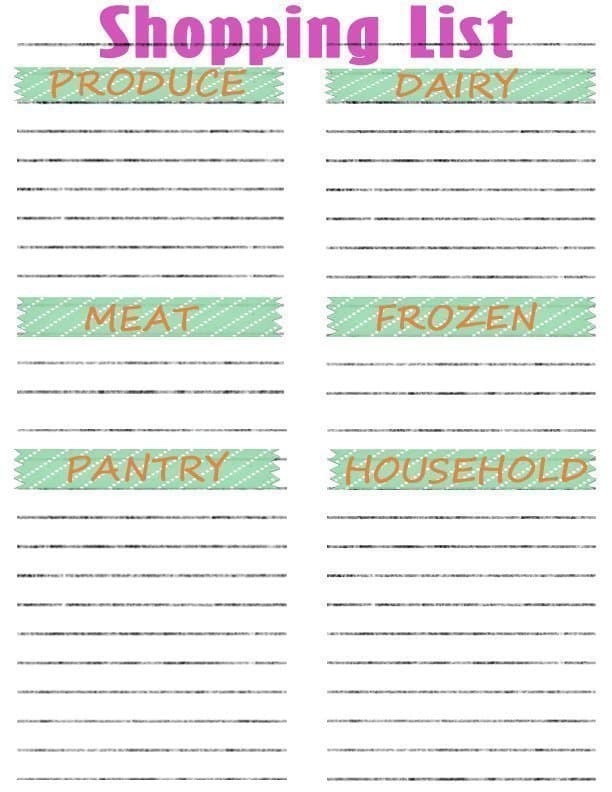 I’ll share my cute recipe template here with you so that you can print it out and write in your own recipes. Gluten-free or not, it might be nice to have to get all those recipes written down and organized instead of loose papers shoved in the middle of 15 different cookbooks. I’ll also give you my cute shopping list. It’s more fun to get organized when things are cute, right? Yeah!! I’m about to be obsessed people!! Hop on my crazy train. If you have a gluten recipe (that is on the healthy side) that you think five little kids will scarf down, please share with me. E-mail me at [email protected] and in the subject line title it Gluten Free at 33 recipes.